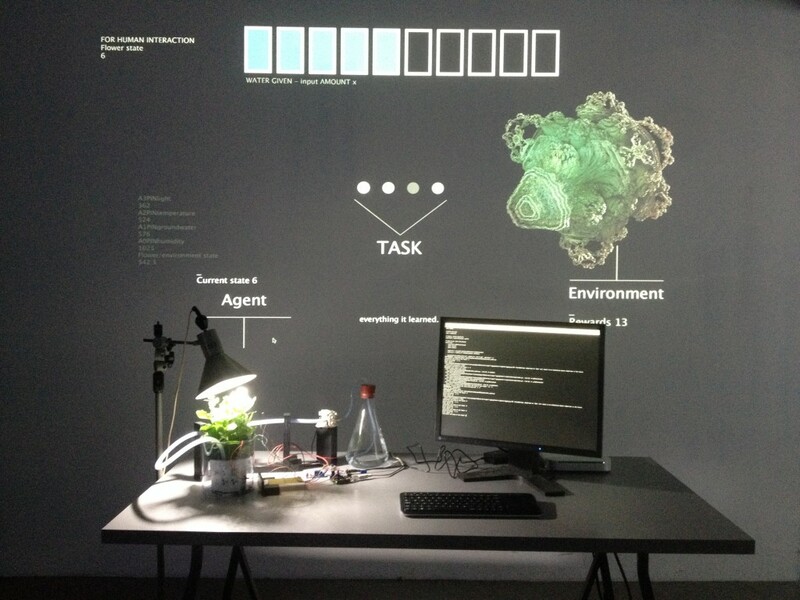 The work is built from a system consisting of two objects: a plant and a neural network. An independent measuring system, reacting only to certain external stimuli, such as humidity, temperature and light, acts as a mediator of the interaction between those objects. The survival of the plant depends on the water level distributed by the neural network in a daily cycle. The “behavior” of the network and its “decisions” about the division of water is shaped by the reward system based on the read-outs of the plant living environment. The survival and the development of the objects is dependent on each other. B-612 was made as a kind of experiment on the possibilities of shaping the interaction between the real and the virtual. Natalia Balska (PL), born in Bielsko-Biała. She graduated in Graphic and Media Design (BA Hons.) from the University of the Arts in London. In 2014, she defended her master thesis entitled “Pigmalion: On the Reality of Relations Between the Man and the Machine” which makes use of the neural networks, whose part is the “B-612″ installation.